A drone equipped with Light Detection and Ranging (LIDAR) sensors and thermal cameras captured this image of a solar farm in the Philippines. Photo credit: Aero 360 International. Drones have the potential to maximize development impact through data acquisition, processing, and management for projects. Development professionals need reliable, easy-to-access, and actionable data to design, implement, and evaluate projects efficiently and effectively. For example, infrastructure projects require extensive data collection, detailed mapping, and regular monitoring. In remote, hard-to-reach areas in Asia and the Pacific, the work involved usually come with a hefty price tag, and may even be dangerous for staff. That is why development organizations are looking at how unmanned aerial vehicles (UAVs) or drones can be used in data gathering and risky operations. Using drones for development is still an emerging field with niche applications. Currently, drone technology is used in transport, energy, water, and urban development projects, as well as to support disaster risk management initiatives. In the Philippines, drones were used in the government’s Kalsada program, which provides financing for provincial road projects. Kalsada, which means “road” in Filipino, requires road videos or Routeshoots to be posted on the OpenRoads portal before, during, and after project implementation. The energy sector uses unmanned aerial technologies to survey and inspect renewable sources. 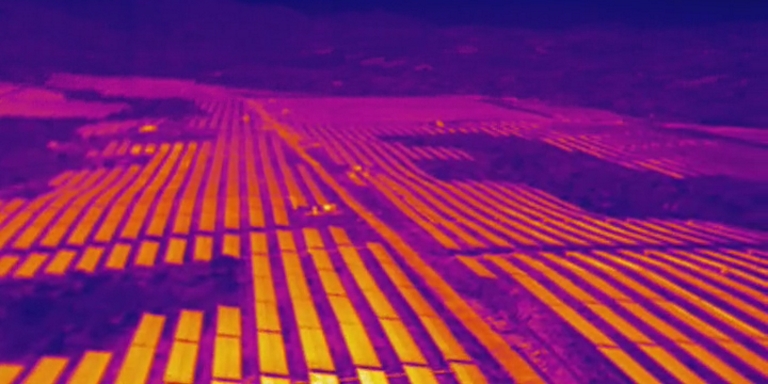 Drones equipped with thermal cameras can detect heat coming off an array, which indicates which solar panel is not working. It can also take three-dimensional (3D) pictures and videos that check for damages, such as dents or holes, on wind turbines. If there are no drones, the usual practice is for workers climb up the wind turbine blades using ropes or scaffolding to inspect them, which can be dangerous, time-consuming, and costly. Water projects use drones to monitor remotely at a higher spatial resolution, and at specific times, such as shortly after a rainstorm when there is typically more sediment in the water. UAV-based monitoring systems offer the benefits of low-cost imaging at higher spatial resolutions and fully controlled temporal scales. These can also provide useful data on land cover and crop health. Urban planners can use drones to create 3D maps and high-resolution aerial images to support projects. Equipped with Light Detection and Ranging (LIDAR) sensors, drones can give accurate data on the number of houses and trees and other physical structures in a given area. Drones are also particularly useful for disaster risk management initiatives, just like how the United Nations Development Program (UNDP) and the Government of Maldives conducted hazard mapping of Maabaidhoo Island. The project team used drones to create 3D maps and topographical maps of the island, which was severely affected by the 2004 Indian Ocean Tsunami. From the data, they were able to pinpoint high-risk areas around the island. The interest for drone solutions for development and humanitarian initiatives is growing. Not surprisingly, countries have increased their regulation of unmanned aerial technologies. A drone pilot who wants to operate a commercial UAV must pass the Knowledge Test on Philippine Civil Aviation Regulations, complete a training course conducted by the UAV manufacturer, and have at least five hours of experience in operating UAVs outside controller airspace. Drones should also be registered at the Airworthiness Department of the Flight Standards Inspectorate Service. Any operator, whether a government or private entity, must also obtain a Certificate of Authorization. The Ministry of Transport oversees drone regulations in Thailand. The government is concerned that drones will be used to spy on people, and that UAVs are potential threats to air traffic. There is no strict regulation on using drones to aid the country’s development. The personal use of drones however is heavily controlled. Only companies that require photography, including the media and filmmakers, are allowed to use drones with cameras. All operators need to secure a permit from the transport ministry. Singapore has the most extensive drone regulations in Southeast Asia. It requires an operator’s permit and an activity permit for flying drones weighing more than 7 kilograms. Recreation or research drones do not require a permit if the weight of the aircraft is less than 7kg. if photographs will be taken in protected areas. The Code of Conduct was reviewed by international agencies, such as United Nations/OCHA, WFP, UNHCR, DPKO, ICRC, ECHO, American Red Cross, MedAir, Humanitarian OpenStreetMap, Cadasta, Peace Research Institute, Oslo (PRIO), Trilateral Research, Harvard University, Texas A&M, Pepperdine University, École Polytechnique Fédérale de Lausanne (EPFL), University of Central Lancashire, ICT for Peace Foundation (ICT4Peace), BuildPeace, DJI, and other independent experts. The document covers guidelines for data ethics, community engagement, effective partnerships, and conflict sensitivity. New technologies like drones offer a platform to scale up the social impact of development projects. There is big opportunity for organizations to maximize its development impact by getting the most accurate data from the field, analyzing it, and using the information to make decisions on project design, implementation, monitoring, and evaluation. Technology can transform the way development organizations help their communities by enabling them to increase operational efficiency, improve risk assessment and risk control capability, enhance accuracy in data gathering and data processing, and increase cost-efficiency. Humanitarian UAV Network (UAViators). Humanitarian UAV Code of Conduct and Guidelines. Google Docs. K. Kaiser. 2016. Drones for better roads: Pointers from the Philippines. Governance for Development. World Bank Blogs. 20 April. United Nations Development Programme. 2017. Drones for Social Good. UNDP Stories. 11 July. Mark Villaflor founded Aero 360 International in 2013 to help the private and public sectors gain critical insights and information through the use of drone technologies for data acquisition, processing, and management. AERO 360 employs modern surveying and inspection solutions, such as Drone-based LIDAR Survey and Thermal Inspections.